How Long Does It Take Most Students To Compete The Nursing Program? There’s an old joke among professionals that tells them that when someone ever asks them a question that they don’t know the answer to, they should say, “Well, that depends,” which gives them time to look up the answer. It’s a funny joke to be sure, but when it comes to answering the question, “How long does it take most students to compete the nursing program?” it’s true. When it comes to earning a nursing degree how long it takes to complete the program depends on a lot of disparate elements. It doesn’t take much research into the field of nursing education to find that there are a wide variety of programs in colleges and universities across the country. Interestingly, these diverse programs aren’t designed with the subject matter being taught as the reason for the time constraints. 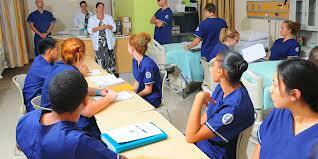 Instead, they are designed to accommodate the largest possible number of those wishing to enter the nursing profession. brought into the healthcare system for the work that needs to be done. This is perhaps best illustrated by the incentives that are commonly offered by hospitals and other institutions in their effort to recruit new graduates as well as those looking for a change of scenery. Among these incentives are high wages, shift differentials, short work weeks, and even more creative perks such as down payments for homes. Despite all of this, the shortage persists for a variety of reasons, icnluding the fact that adequate qualified nursing professors are not available to teach the number who are willing to give the profession a try. Depending on the level of nursing one wishes to achieve, there are a wide variety of educational requirements for different degrees. Licensed Vocational Nurses, or LVNs, usually have less than one year of nursing school or instruction at a vocational college. The minimum education for a Registered Nurse, or RNs, is two years, often completed at a junior college. The next higher level is a four-year RN, which is completed at a combination of junior and senior college or just a four-year college or university. It is usually at this level when most nurses start their clinical practice. The next level for most nurses who wish to pursue higher levels of responsibility is the degree of Master’s of Science in Nursing, or MSN degree. This program can vary widely in its time to complete, especially when a candidate enters the program without the necessary prerequisite coursework for the MSN program. Depending on the time it takes, whether part time or full time, these can take a year or more. After the candidate completes the prerequisites, the MSN program normally runs between 18 and 24 months. If nurses wish to advance beyond this level of their profession, a doctorate is usually required. Those with this level of degree normally teach, do research, or enter the higher levels of clinical work. A doctorate of nursing normally takes two to three years for completion. This depends on the level of education and the institution that offers the program.